Rav Yosef Sonnenschein attended Yeshivas Chaim Berlin in Brooklyn, NY and then Pachad Yitzchok in Har Nof, Yerushalayim, where he developed a close relationship with its Rosh Yeshiva, Harav Yonasan David, shlit”a. Upon returning to the States, Rav Sonnenschein studied halacha in Kollel B’nai Torah for several years before moving to Waterbury, Ct., playing a pivotal role in shaping the unique character of Yeshiva Ateres Shmuel and the Waterbury Kehillah. 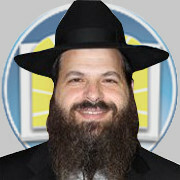 He has been an immensely popular Maggid Shiur in the Beis Medrash, known for his unique style of depth and clarity in Gemara and Machshava. As the community grew, Rav Yosef was called upon to serve as Rav of K’hal Bnai Shalom transforming the shul and community into a true Makom Torah. He is also a source of counsel and inspiration to many in the community. We are very fortunate to have R’ Sonnenschein as a S.I. Magid Shiur.